More great press for Tom Brady vs. the NFL: The Case for Football’s Greatest Quarterback, this time from Pete Redington of the Valley Advocate. This one’s a feature/interview piece with me more than a review of the book, so it doesn’t lend itself all that well to pulling out quotes. But it’s a damned nice piece (said the subject of said piece) and you should just go and read it. Like, now. 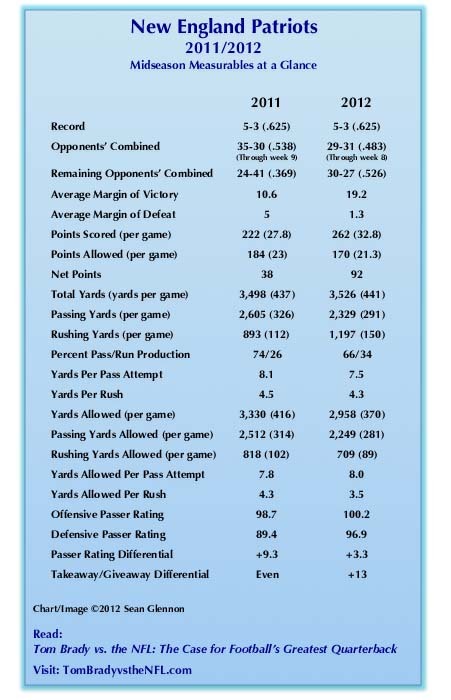 Four weeks ago, eight games into the season, I put together and shared a chart looking at how the 2012 New England Patriots measured up to the 2011 AFC Champion squad on a bunch of key measurables. Last night, I decided that if it made sense to look at that data at midseason, it must make sense to look at it again at the three-quarter mark. 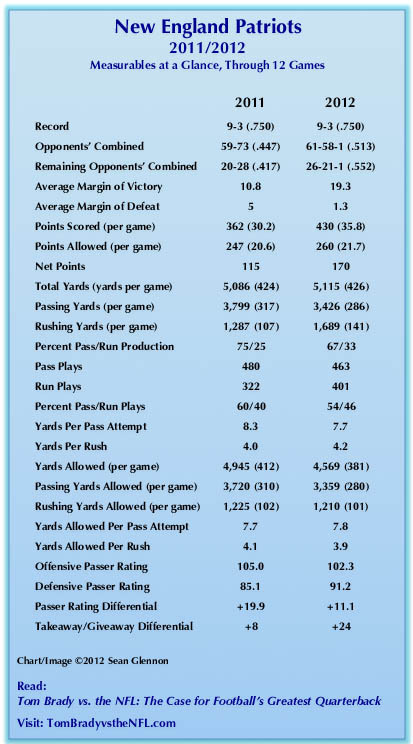 So here’s your new 2011-2012 Patriots comparison chart. Thanks for geeking out with me. So I was psyched to do the show last night, while I watched Cam Newton pick apart the Eagles. You can check out the whole thing here if you like. You probably should. It’s good stuff. The positive notice for Tom Brady vs. the NFL: The Case for Football’s Greatest Quarterback continues to roll in. The latest comes from Michael Hamm of Musket Fire, who reports that he didn’t necessarily get what he wanted from the book, but he got what he needed. He particularly liked what I wrote about the drive Brady orchestrated to set up Adam Vinatieri’s game-winning field goal in Super Bowl XXXVI. “Tom Brady is the best quarterback ever to lace up a pair of cleats, that much is made abundantly clear in this book. OK, that’s all the quoting I’m going to do. Go read the whole thing for yourself. In Holyoke This Evening. Walpole Saturday. I’ll be signing copies of Tom Brady vs. the NFL: The Case for Football’s Greatest Quarterback at the Barnes & Noble stores in Holyoke, Massachusetts today (Friday, November 16) from 6 to 8 p.m. and Walpole, Massachusetts tomorrow (Saturday, November 17) from 1 to 3 p.m. If you’re in either area, you should come by. Pick up a book for yourself and discover what Kevin Braig of Cold, Hard Football Facts and Steve Balestrieri of PatsFans.com like so much about it. Pick up copies for the Patriots fans on your holiday shopping list. A signed book makes a great gift. Or, hey, just come by and say hello. If we know each other on line, it’d be great to meet you face-to-face. If we know each other in person and you’re actually willing to look at my mug, I’ll be happy to see you. For directions and store contact info, head over to my events page. My upcoming reading/discussion/Q&A at Trident Booksellers & Cafe in Boston just got better, thanks to the great folks at Triumph Books. The event, which takes place Wednesday, December 5 at 7 p.m. at the Trident (it’s on Newbury Street; you can get directions via the link on my events page), will now feature a drawing for a great giveaway package. Win it, and you’ll be done with holiday shopping for the Patriots fan in your life. Or you can be, like, the greatest Secret Santa of all time (no need to tell them you didn’t spend a nickel). Or you could just keep it for yourself (hell, you deserve it more than those other ingrates anyhow). And, of course, I’ll read some selections from the book, talk about what’s behind the book (what it is, what it isn’t, and why — that sort of thing) and answer your questions. I’ll also sign books for those who are interested. So, you know, get there. And tell your friends to get there. And their friends, too. It’s gonna be a lot of fun. I had me a pretty good day yesterday. As previously discussed, the morning brought a terrific review of Tom Brady vs. the NFL: The Case for Football’s Greatest Quarterback from Kevin Braig, Quant Coach, on Cold, Hard Football Facts. Evening produced yet another well-written and very positive review of the book. This time from Steve Balestrieri of PatsFans.com. I didn’t fret over this one like I did about the CHFF review, largely because I didn’t know it was in the works until pretty late in the game. But I’ve got to know Steve on line (and a bit on the radio) and I can assure you he knows his football and his Patriots, so his opinion means a lot to me. So, you know, that’ll make a guy feel pretty good. Go read the whole thing, because Steve’s got a lot of interesting stuff to say. Some time ago, I heard from Kevin Braig, Quant Coach, that he was planning to review Tom Brady vs. the NFL: The Case for Football’s Greatest Quarterback for Cold, Hard Football Facts. I was thrilled. And I was scared to death. I’m not typically one to sweat a review. Not that I don’t like good ones. Not that the bad ones don’t bother me. It’s just that you can’t do anything about them. If you’re wise (or if you’re able to pretend your wise), you just sit back and take them as they come. This one was different. Because, well, first of all, there are a lot of football media outlets I admire and respect. But CHFF (along with Football Outsiders) sits at the top of the list. This is media for people who think a lot about football by people who think a lot about football. It’s an outlet that has earned my respect and that keeps earning it just about every day. I want everyone who reads TBvNFL to enjoy the book. I hope everyone who reads it will be able to see that I worked hard to earn both the time and money they put into it, and will come away feeling like the experience was worth the price of admission. But when it comes to the people who run and contribute to sites like CHFF, I want to believe that I’ve earned their respect just as they’ve earned mine. I’ve also come to think highly of Kevin. He’s a guy with a clear perspective on the game and a deep understanding of it, whose work has influenced the way I think about football. I wanted him to like the book. I pretty much got my wish this morning. Here are some of my favorite quotes from the review. Steve Balestrieri, one of the guys from PatsFans.com who has already been entirely too kind to me, had a few really nice things to say this morning. Can’t not share stuff like this.